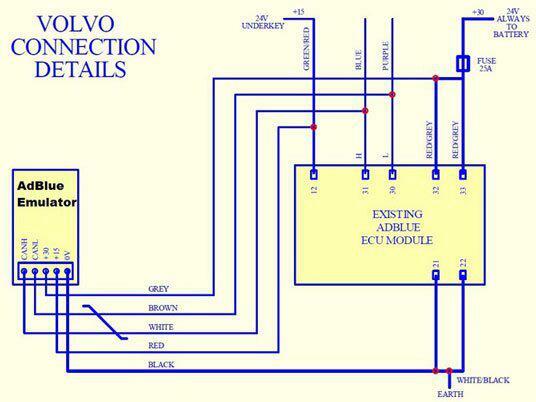 Box bypasses electronic module of the Adblueobd2 system on vehicle. Adblueobd2 liquid. Adblueobd2 Emulator Box disables Adblueobd2 system electronics gently so there will be no power loss of the engine or any warnings on the dashboard and in diagnostic system. The connections details diagram and wire colours refer to MAN TGX18-440 Year 2009, but the main procedure of the minusblue module does not vary. 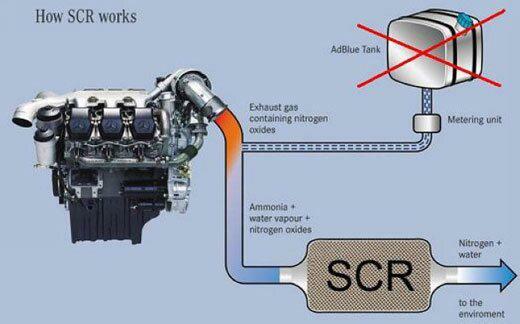 Before proceeding make sure no faulty codes are memorised in the original ECU, Adblueobd2 liquid is higher than the reserve level and the truck batteries are disconnected from the system. 3) GREY(+30). To be connected to a 24V supply always available to the existing Adblueobd2 system (F738 protection fuse and the Adblueobd2 system). It is important to connect the GREY ACTIVATION WIRE(+30) to a 24V source always available(battery), moreover, the soldering operation must be done between the 20A fuse(F738) and the existing Adblueobd2 module. If you want to stop and exclude the original Adblueobd2 module from working, all that needs to be done is to remove the F738 fuse before starting the engine. The minusblue module will automatically be activated. To re-instate the original Adblueobd2 module, all that needs to be done is to reinstall F738 fuse before starting the engine. The minusblue module will automatically be de-activated. Adblueobd2 module the truck batteries can be Re-connected. 1) If the F738 fuse is installed the original Adblueobd2 system will be working. Both red and green leds will be on. 2) If the F738 fuse is not installed the original Adblueobd2 system will not be working and the minusblue module will be activated. Both red and green led will be flashing.